Many of us are still processing exactly what happened last week. It is hard to reconcile the city you know so well with the images of terror. For me, the thought process began with… that building is familiar. Yes, I was at that store last week. My kids and I once had an impromptu picnic in the park down the street. What am I looking at? This is not happening. What is going on? …and then you see the uncensored pictures that later will be cropped for tomorrow’s paper, and you know your city will never the same again. A city is its people. A city is its buildings. A city is its streets. I remember walking in Back Bay with a native of Oklahoma who was amazed by the foot traffic in Boston. People were walking everywhere, and it was February. Bostonians own their streets through the cold and the warm; snow, sleet, and rain; and the good and the bad. (Have you ever tried to drive downtown?) That’s why many of us were equally shocked by images during the shelter-in-place order because we have never seen our streets and buildings without its people. 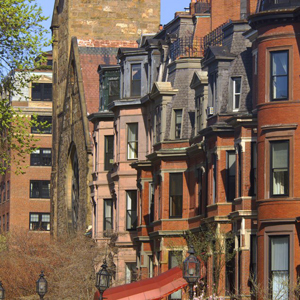 As architects we have a hand in how the Boston we know is shaped, developed, but most importantly is occupied. Our work includes both the grand gestures that scrape the sky and the proud, humble bench that weary legs rest upon. We make decisions that benefit others. We lead through design—humble and strong. We shape the places where events happen. I consider my work to be a noble, quiet leadership. It may never get spectacular headlines, but if it provides comfort and joy to at least one citizen of Boston—I will know the work I do is important. In 2008, the American Institute of Architects gathered in Boston for their annual convention. It was one of the best weeks of my professional life. I was so proud of my city at the time, but that pales in comparison to how proud I am of Boston today. I am proud that its people are again in the streets, that Marathon Sports will once again open on Boylston Street, that I see countless number of runners every day running in solidarity, of the many world-class hospitals and the equally world-class architects that contribute to their design to help heal the injured, but most importantly of the Boston spirit and resolve to continue on. Last Tuesday, still in shock, I saw this button at my desk and I cried. 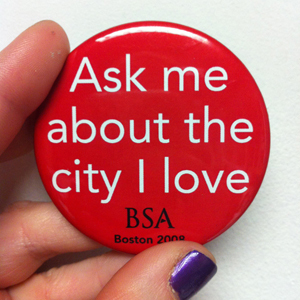 When you ask me about leadership at the AIA Convention in Denver, ask me about the city I love. This post was inspired by challenge of the 2013 AIA Blog Off to write about what “architect as leader” means to me. Visit the web site to read the unique voices of other architects. Great piece Emily! I was thinking of many of the same contributions of architects to our city when I was writing my post on this same topic. I think you have very eloquently framed how the architectural community in Boston feels about our city.